Strength, Versatility and Simplicity in Three Options. The Sunflower 9900 Air Car is the perfect complement to the 9800 Single Disc Air Drill. Fact is, the combination not only creates the industry’s most accurate seeding machine, but it provides the versatility to efficiently meet the needs of virtually any farming practice. Choose the single-axle with duals Model 9930 for a total capacity of 525 bushels in three tanks — 175 in the front, 225 in the center and 125 in the rear tank. The 9930 can also be set up for tow-between or tow-behind configurations. Or take your choice of two versions of the two-axle Model 9920, for exceptional tow-behind performance. The 9920-335 has a 200-bushel tank in the front and a 135-bushel tank in the rear, while the 9920-280 has a 168-bushel tank in the front and a 112-bushel tank in the rear. All three models feature stainless steel commodity tanks for even more versatility and value on your investment. Commodity Tanks: The stainless steel Air Seeder tanks are set up in 3 configurations. The 525 bushel 9930 has a 175 bushel tank in front, a 225 bushel tank in the center, and a 125 bushel tank in the rear. The 9920-335 has a 200 bushel tank in the rear and a 135 bushel tank in the front. The 9920-280 has a 168 bushel tank in the rear and a 112 bushel tank in the front. The model 9930 can be set up as tow-between or tow-behind configuration. The 9920 models are tow-behind. The 9930 is single axle only with duals and the 9920 models are two axle set ups with single wheels. The axles on the 9920 models can be spaced at 120 inches for row crop applications or staggered with the rear axle at 150 inches for reducing compaction. Poly cup flighting in the augers assures gentle handling or fragile seeds. Lug tires concentrate the load on the lug area so that there will be un-compacted soil for the seeds to emerge. Load and Unload Auger: The auger is double hinged for exceptional balance, allowing one person to easily load and unload. Unloading and loading are quickly performed with an 8-inch auger on the 9920-280 and a 10-inch auger on the 9930 and 9920-335. A two position latch pin allows the auger to be deployed just enough for filling or to be deployed fully for unloading. A rotary valve on the auger allows for variable speed of the flighting in either direction. Operator Safety: All air cart access has operator safety in mind, with grab handles at every climbing point and tread plate platforms for safe footing in all elevated positions. Side rails have double horizontal bars to protect the operator in standing or kneeling positions. The railings are secured in the raised position when operating the air system. The railings may be lowered for storage if required. Maximum access to compartments on the Sunflower 9930 is afforded by catwalks on three sides of the lids. Raised divots in the catwalk provide extra grip for walking or standing. Compartments and Lids: Stainless steel construction of the tanks create the perfect environment for long life, corrosion free performance. Nothing that can corrode is used in the manufacture or assembly of the tank and meter. Angled steps shed product so tank cleanout between varieties is as simple as possible. A “dog house” directly over the meter provides uniform, bridge free product flow. The compartment lids on the air system compartments are designed so that when closed they will be sealed. With the lid open, the air pressurizing line and access ladder can be seen. The compartments are always under a positive pressure during operation to ensure accurate product flow to the meter system. The ladder offers easy access to the lower portions of the compartments for service and cleaning. ISO Monitor System: Sunflower ISO monitor systems are fully ISO compliant. All of the Air Seeder Cart functions including, fan speed, tank levels, acres, ground speed, meter rpm, and variable rate are reported and performed reliably. When combined with any Sunflower seeding tool, optional run blockage, NH3 control and automatic on/off work functions combine with the tank Air seeder cart monitor for complete monitoring and control. Virtual Terminal (optional): The 1000 color virtual terminal is the perfect compliment for the ISO Air Cart monitor. With easy to understand screens and simple operator interface, seed with confidence knowing you have full knowledge of the operation of you seeding system. Air Delivery System: The high efficiency air system design utilizes 6-inch diameter fans that are powered by a fixed displacement piston pump. Large hydraulic lines decrease flow restrictions for less heat buildup under higher fan speeds. All models are standard with one fan and the model 5250 has optional two. Hydraulics: The blower, auger and variable rate meters on the Sunflower air carts are all managed off of one tractor hydraulic circuit. One central hydraulic block with well labeled ports makes assembly and trouble shooting easy and less confusing. Pulse width modulated valves reliably and accurately control seed rate. There is a valve for each meter. Ground Drive System: On air carts equipped with ground drives, a magnetic clutch allows the drive to be disengaged. The magnetic clutch uses electrical power to hold it engaged. The clutch is turned on and off when the magnetic work switch on the drill relays the status to the ECU on the air cart which in turn signals the clutch. The clutch may also be controlled manually by pressing the Master Work Switch on the virtual terminal in the cab. Variable Rate Drive: Air systems equipped with the variable rate option use electric over-hydraulic (EOH) technology to control the meter speed independently of ground speed. This gives the operator the benefit of a faster calibration procedure and on-the-go rate changing capability as well as the potential to apply product to a prescription map using GPS. The variable rate control valve diverts 5 GPM of hydraulic fluid flow from the fan circuit to power the variable rate drive motors. An electro-proportional flow-control valve controls the speed of each motor, allowing the meters to turn at speeds completely independent of each other. The 9530 is variable rate only. Meter Drive: Direct drive hydraulic motors on the meters give precise metering control with instant response to rate changes on the go. Whether operator directed or if operating from a map, it is simply the most reliable, accurate, and responsive of any offerings in the industry. The motors also power the meters for calibration. Calibrating is a simple as collecting a sample from the meter, weighing it, and reporting the weight to the virtual terminal. Meter Roll Options (4): Two of the Amity meter rollers are constructed of stainless steel and two machined and powder coated for lifetime performance. The high capacity roller has eight ½ inch deep bars and is used for most applications. The medium capacity roller has twelve ¼ inch deep bars and is used on smaller machines or for consistently lower seeding or fertilizing rate. The low volume and canola rollers are the machined rollers and have a pattern of shallow depressions for very low seeding rate. Since they are not used with fertilizer they do not need to be stainless steel. The canola roller is shown on the right. Linear Seed Flow: Accuracy is the key and that is why Sunflower utilizes unique spiral fluted metering cylinders that gently roll product into the airstream in a constant flow. This is in contrast to uneven dumping of straight fluted metering wheels. Made from stainless steel for long life, the Sunflower metering cylinders handle a variety of seeds from canola and wheat to large beans as well as fertilizer with an easy change of meter cylinders. The variable throat on the meter is easily set to maximize meter performance to accommodate large changes to the amount discharged. Gentle Handling of Seed: Seed is gently paddled across the rubber flap in the meter tray into the airstream. There are no stripper bars or tight tolerance area to pinch seed. 1/2 inch deep scrolls on the metering cylinder further protect large seeds by nesting them in a deep chamber. 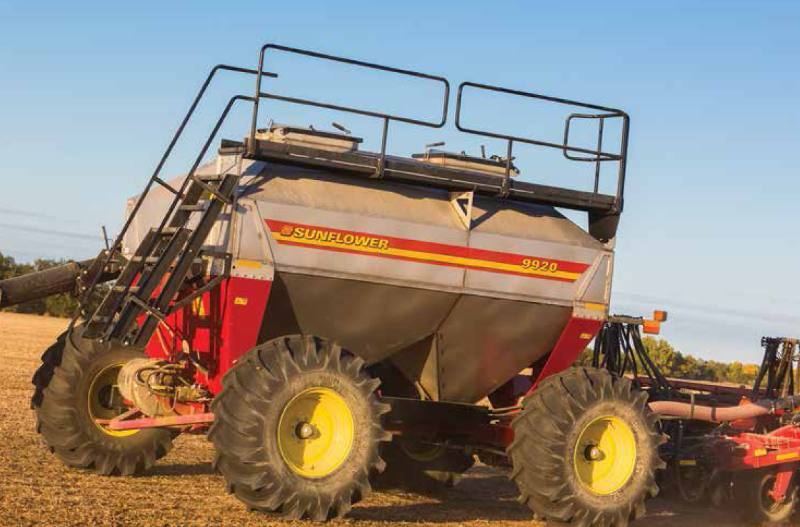 9930 Dual Shoot: Each meter on the 9930 Sunflower Air Cart can deliver product to either airstream on units equipped with the dual air stream option. To control the flow, a blocking plate is simply inserted to deflect the product into the desired air stream. When changing product needs require machine reconfiguring, a few minutes is all that it takes to reroute the meters. The 9920 Series does not have the double shoot feature.